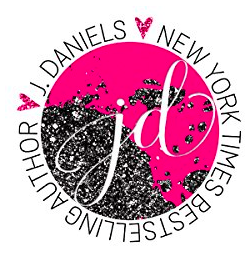 5 QUESTIONS with J. DANIELS Author of The Dirty Deeds Series and so much more! 1. In Four Letter Word the characters meet accidentally can you tell me about a Happy Accident you have had in your life? I’m a mom of twins! That was completely accidental! 2. Tell me 1 Album 1 Book 1 Friend and 1 Food that changed your life and why. *Third Eye Blind (Their first album, which I believe is titled Third Eye Blind) That album was my high school life. And high school is tough. Anytime I put on a song from that album now, I get hit with so many memories. *Can it be my own book? Sweet Addiction completely changed my life. I couldn’t get an idea out of my head, and then I published it, not thinking anyone would want to read it. I wanted to read it, so that made me happy. I sold 8 copies that first day. I cried like a baby. *My husband. I know I know. That sounds so cliché. But he is my best friend. Sometimes I’m like, yeah. It’s just me and you, buddy. And he smiles and says he’s good with that. I can’t imagine not talking to him every day. *Picking one food that changed my life is tough. I’m a foodie. I love food. But if I have to narrow it down, I’m going to go with cupcakes. A good cupcake can brighten up your entire day. A GREAT cupcake can change your life. There’s this bakery near me that makes these black bottom cupcakes. Oh. My. Life-changing. 3. I know, as a reader and fan that there are little pieces of your heart and soul in all of your books (that’s what makes them magical) are there any little factual things about yourself in them, and if so can you share three? Like locations or a characters personality traits, or likes / dislikes? I always put little bits of my hometown in my books. Store names. Town names. I love it when readers from Maryland figure it out and message me. Ruxton is a made-up town in Alabama, (the setting of my Alabama Summer series) but it’s a town in Maryland. The bar Jamie and Tori go to in Hit The Spot (Hammerjacks) is an old club in Baltimore that closed down years ago. I went when I was in college. In Four Letter Word, I made Sydney an x-ray tech, which is my day job. Oliver and Olivia were inspired from my own kids. They were also born ten minutes apart. There’s always something personal in my books. In terms of personality traits, Dylan’s inner monologue in the Sweet Addiction series is my inner monologue. 4. If you could live a day in the life of one of your characters, who would you choose and why? Tori or Sydney from the Dirty Deeds series. I’ve always wanted to live at the beach. And I love North Carolina. I’d move there in a second. 5. We are all (not-so)patiently awaiting the arrival of HIT THE SPOT book #2 in the Dirty Deeds series! Can you give us 5 little hints of what we can expect in your next book, and will we be lucky enough to expect a 3rd book in the series? Those good? And we shall see about more books. I would love to continue this series.